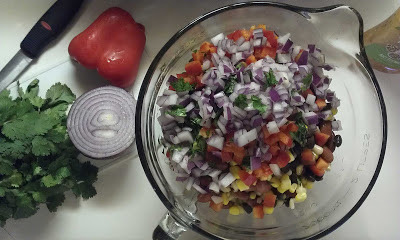 I made this super yummy salsa the other night for a Christmas party. It's easy to make, and it makes a lot. Perfect for a get-together. 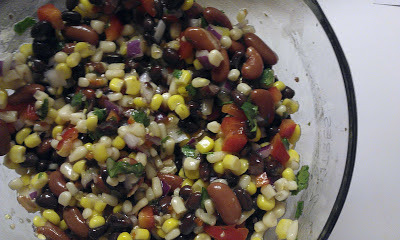 Or if you are having a major bean and fresh veggie craving ;). Combine all ingredients in a large bowl. Toss to coat. Refrigerate for at least an hour before serving. Serve with tortilla chips. Enjoy! I love this stuff. Have you tried eating I tried eating it wwith tostitos hint of lime tortilla chips? You should. It is fantastic. I love black bean salsa! Thanks for the recipe. It tastes good with so many things! and what Julie said above, those chips ARE good! You can also put a scoop of it in your salad with some cooked chicken and southwest ranch sauce for an awesome southwest chicken salad!